Hello! I hope you are having a wonderful weekend so far! We have two sick kiddos which kept us home from church this morning, so I decided to play in the Featured Stamper Challenge on SCS : ) This week's FS is Shannan Teubner! I LOVE Shannan's style so I was very excited. I chose to CASE this beautiful card of hers. I really loved her layout so I kept mine pretty much the same besides adding an extra layer and using a scalloped frame around my sentiment. I used this ADORABLE stamp set called Fhiona and Friend Penguin from Your Next Stamp. I used dp from a K&Company mat pad called BW Peppermint Twist that I picked up at Joanns. 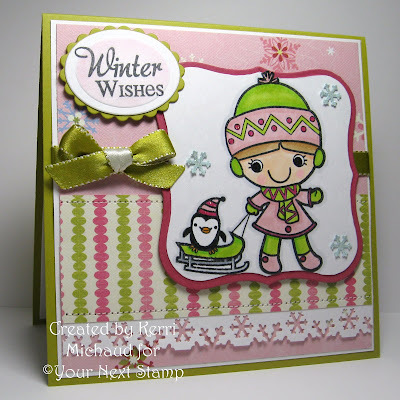 I just love pink and green together : ) The border was punched with the EK Success Snowflake Border Punch. I also punched a strip of Soft Sky cs to get the snowflakes that I adhered to the image panel. The sentiment is a freebie I got from Verve. Thank you so much for stopping by and I will leave a full recipe below. Don't forget that through tomorrow you can get FREE SHIPPING from YNS by using the code SS1 so go take advantage!!! Love the color combination! This set is really cute... now I need to get this one too! Kerri oooo girl I LOVE this paper for Christmas, your image is SOOOOOO ADORABLE!!! This is totally adorable!!! Love it, Kerri! What a sweet card! Nice job Kerri! This is so so so cute Kerri! Hope you kiddos feel better soon Kerri. Your card is so cute! This card is so adorable!! Love the color combo. This is sooooo adorable - - I knew you loved pink and green together....and it is a great combo. I love your little border punch...I don't know that I have any Christmas border punches - - yet *wink*. Great coloring as usual! That image is so adorable! I too love the pink/greens together and you did a fabulous coloring job! That snowflake punched border is awesome, as well as your bow! Just love it all Kerri! What a fantastic blog you have! All the beautiful cards you have created are just so inspiring. Simply wonderful! I love the pink and green on this! It's so pretty. The border is awesome. I hope your kiddos get to feeling better right away! This image is adorable...your colors are perfect as is your design around the image!!! Hope your kids are feeling better! And wish them to get well soon! What an adorable card! Love this sweet little image! Such a darling card and Fhiona looks awesome. Great take on to the sketch.